It seems like ages since I had been to The Stand Comedy Club Edinburgh, well it had been over a month, what with the ‘Festive’ period and the arctic weather that seems to have a grip on the Athens of the North, but enough was enough. It was time to renew my acquaintance. I, along with the rest of the full house, braved the still Baltic weather and took my place in anticipation of the comedy fare on offer for the night, suitably refreshed with the quality food and reasonably priced beer the scene was set. 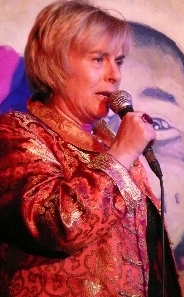 Compere for the night was the effervescent Susan Morrison. As usual with this gregarious Glaswegian, resplendent in a highly decorative jacket, the opening segment was a hoot. The larger than life persona that she exudes as always sets the tone for proceedings, bantering with the audience drawing out information for herself and others to ‘call back to’ and getting the up for it crowd prepared for the line-up. Ms Morrison is always entertaining as either an compere or if she is doing ‘a set’, but I thought she was on fire throughout the evening. Opening act was Michael J Dolan and it was the first time I had become aware of him. His task of opening the night had been eased by the classy warm-up and he oicked up the baton with ease. I think it is fair to say he is not the most up-beat comedian on the circuit, he likes to opine a fair bit on negative aspects of life and relationships, however his set is well constructed, generally funny and well delivered. Often self-deprecating in delivery, I think the guy is assured of a good future in the business. Certainly I would be happy to see him again. 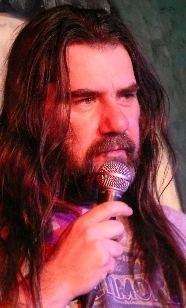 Following the first interval Susan introduced Edinburgh based West Country raised Alan Sharp. Now he is really larger than life, a big fella with really long hair and a full beard. No wonder he says he’s confused with Hagrid from the Harry Potter movies. However, although he likes to moan about everything, his set was packed with quality material well observed, written and delivered by a guy with stage presence to spare. Unfortunately his short set was over all too soon. He is a name I will look out for in the future. 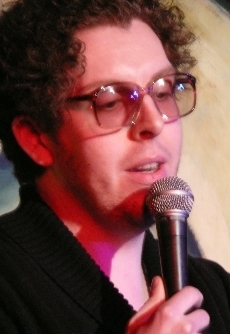 The closing act of part two was Stand favourite Keir McAllister. Over the past few years I have seen this prolific and extremely talented comedian quite a few times and have never been disappointed. 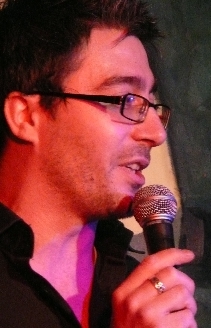 He as always grabs gigs by the throat, he is always well prepared and has a seemingly endless supply of excellent comedy material. His rapid delivery style really makes one listen to his set to get the most benefit, as he is not afraid to share his opinions on Thatcher, Aberdeen, Dundee, Reality TV programmes and relationships amongst other subjects. McAllister is surely destined for bigger and better things than he has already achieved, and I hope it will be sooner rather than later. Following the second interval and prize draw, Ms Morrison introduced the headline act Carl Donnelly. Now I had been aware of this rising star from South London over the last couple of Edinburgh Fringes, but circumstances conspired such that I never managed to catch his show. Having now put that to rights I can see at once what all the fuss is about. This guy is surely destined for the top. 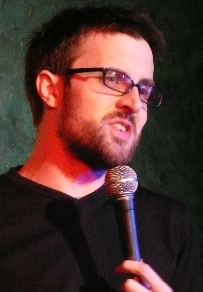 He immediately took control of the club from the off, and his style of relaxed humour, mostly observational and also self-deprecating really struck a chord with the audience. He, I’m sure, had a load of prepared material, but I’m sure we only saw a fraction of it on the night. He takes ideas and runs with them, occasionally even surprising himself I think at where these go, but the natural raconteur in him rises to the occasion and makes these, almost rambling at times hilarious. Donnelly has presence that would easily translate to TV I’m sure, however on the evidence I have seen, live work and interaction with his audience is his forte. Having now seen him do albeit a 20 minute set that lasted 30, I will be looking for Fringe brochure 2011 hoping to find him in it for a full hour. But beware one4review team, I’m reviewing him, so back off. Thus concluded another excellent night of entertainment at The Stand. And was just one of the many that they offer virtually 365 days a year both in Edinburgh and in Glasgow. Check out their website at www.thestand.co.uk and hopefully I’ll see you there.